Christopher Kerosky has been an immigration lawyer for over 25 years and has personally handled more than a thousand asylum cases. He has offices in Santa Rosa, Napa and San Rafael. TIES THAT BIND Many refugees from Mexico and Central America have family in Sonoma and Napa counties. The nation is currently enduring a lengthy government shutdown because Congress won't give Donald Trump $5.7 billion for a border wall he said that Mexico would pay for. But the supposed border crisis that requires a new wall is based on Trump mythology—a series of "alternative facts" that he and his acolytes continuously put forth. Many of these are amplified by media outlets and talk radio such that large numbers of Americans are misled about the state of the border and immigrants who pass through it. Why should we in the North Bay be so concerned about Trump's shenanigans on the border? There is a humanitarian crisis at the Mexican border—although not one that a wall will solve. Thousands are being held by Customs and Border Protection in inhumane conditions at border facilities. Others are living in squalor at camps on the Mexican side of the border, awaiting asylum processing. Many of these refugees are from regions of Mexico and Central America with large populations in the North Bay. Many have close family in Sonoma, Marin and Napa counties and end up settling here. Our country has handled refugee crises before. Thousands of European refugees settled here after World War II. In the 1980s, we opened our door to Cubans, Eastern Europeans and others fleeing communism. As before, we ought to work on an orderly and humane manner for handling their claims of persecution—a solution more worthy of a nation of immigrants than an expensive and ineffective wall. One of the oft-repeated myths is that illegal immigration through the U.S.-Mexican border has been rising and now is higher than ever. Actually, there has been a net drop in undocumented immigration from Mexico over the last 10 years; the overwhelming majority of those trying to cross illegally are now caught and subject to expedited deportation. Many more undocumented immigrants have been deported over the last decade than ever before. In truth, half of the undocumented immigrants here are visa overstays, usually from Europe or Asia. In fact, a large portion of the refugees at our southern border are entering the United States legally, seeking asylum under the Refugee Act of 1980. The Trump administration is trying to cut off these legal paths to asylum. But the truth is that most of these families at the southern border—including the caravans of asylum seekers Trump has condemned—are actually following our own immigration laws and procedures. Most of those seeking asylum are from parts of Mexico or Central America ravaged by violence at the hands of criminal cartels or gangs. Extortion, kidnapping and murder are commonplace there. 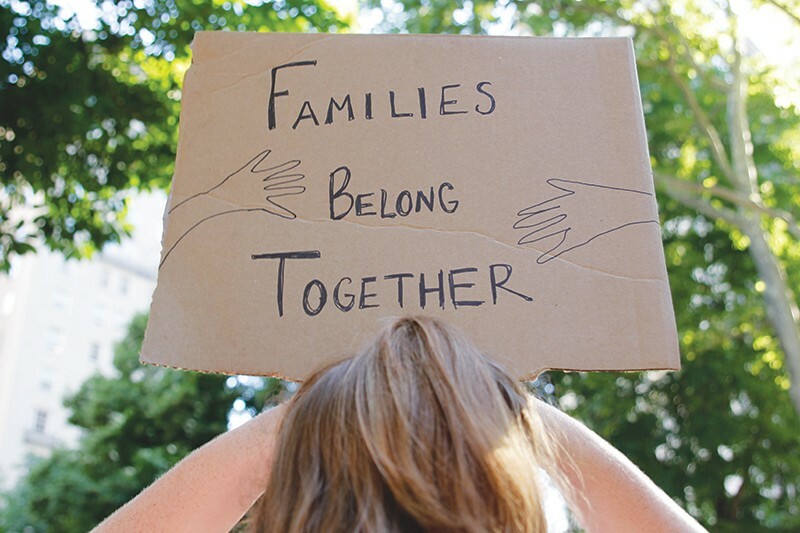 Virtually all of the asylum seekers I've met reported that their families were targets of this violence and were threatened with more violence if they stayed in their communities. Department of Homeland Security officials have admitted there has never been any evidence of terrorists entering our southern border, and the claims that gang members proliferate among those seeking asylum is completely unsupported by fact. All applicants for asylum go through an interview process at the border to determine if they have a "credible fear of persecution" in their home country. Those who fail these interviews are deported immediately. Those found to have a credible fear of persecution still have to wear an electronic monitor in order to get released. Later, they have a trial before an immigration judge and must prove they have a "well-founded fear of persecution based on religion, race, nationality, political opinion or social group." If they fail to do so, they are deported. Trump has falsely claimed only 10 percent show up for their hearings. In fact, the overwhelming majority who file asylum claims appear in court and a substantial number have proven their eligibility for asylum. Despite repeated claims to the contrary by Trump, undocumented immigrants do not qualify for welfare, food stamps, Medicaid or virtually any other form of government assistance.